Fresh to eat, easy to prepare, healthy to our body is toothsome Aval upma. Aval is otherwise known as poha or flattened rice flakes in English. Sometimes we are really confused what to prepare as special for breakfast, it should be a delicious and less time-consuming dish! choose this, store it in your mind as instant cooking. Many regions in India prepare this type for breakfast or snack time dish. It is an ideal dish for children too. Crunchiness of nuts and special aroma with ginger and capsicum, awesome taste . 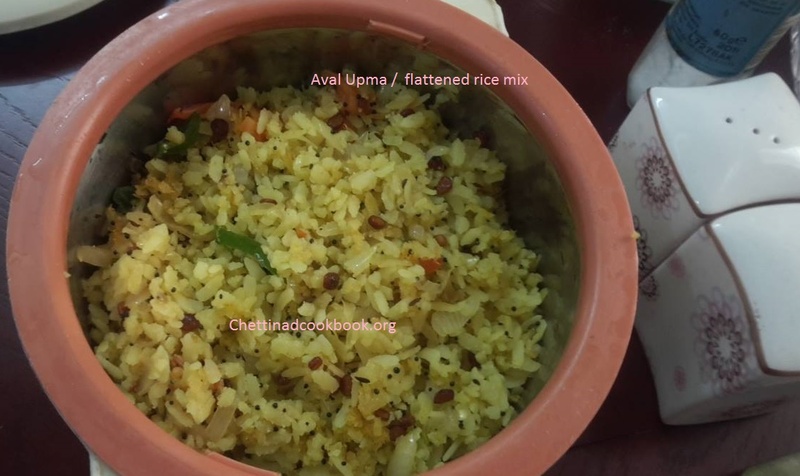 Aval / Flattened rice – 2 cups Serves 3 to 4 person. Wash two times and drain water completely with a strainer. Let it stay in the strainer. Add onion slices,ginger and green chilli saute for a while, mix salt and turmeric powder. Now add tomato and cook till it leaves its skin. Finally, add curry leaves and chopped capsicum stir for a while. Add aval to the mixture, cook all together for 5 to 10 minutes over a medium flame. Palatable aval upma is ready to serve.